Because saying thank you and being truly thankful need to be purposefully introduced and reinforced with kids of all ages. Cindi Albright (Image modified). Some rights reserved. My heart soars whenever my two-year-old says thank you (pronounced sank-yoo) without prompting, and my blood boils whenever I don’t hear my teenagers’ friends say it (regardless of the pronunciation). When it comes to being thankful, it’s definitely one of those qualities we want to see reflected in our children’s overall personalities, along with being kind, honest, reliable, etc. While a simple thank you can become an ingrained rote response that kids figure out the meaning behind as they age, being truly thankful can take some more purposeful direction. 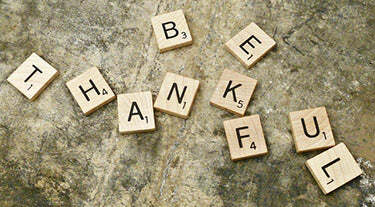 These 4 suggestions will pave the way to encouraging thankfulness in kids. Just like Sir Isaac Newton’s falling apple inspired his understanding of gravitational force, parents need to drop the proverbial apple when it comes to helping kids understand thankfulness. Being thankful parents does not mean that quality will be automatically passed on to the kids. They key is having conversations, setting examples, and sharing the thoughts and feelings behind this abstract concept. It’s imperative to be purposeful in building positive qualities in kids. Every moment doesn’t have to be turned into the teachable, but being mindful of the impact of our words and actions is a must. A quick Google search will produce any number of variations and templates for this family-oriented activity. By starting with a cut-out of a turkey head and body, family members record I am thankful for… statements on turkey feathers to create a wall or fridge display as the turkey grows with each thankful addition. This activity can go on for a week or more and/or even be an extended-family endeavor on Thanksgiving Day. As feathers are added, family members should share why they are thankful for their chosen responses being sure to share both concrete and abstract ideas. This allows kids to conceptualize the idea that we should be thankful for more than just things. While there are definitely possessions for which we are all thankful, it’s an important lesson in thankfulness and life in general to not let these possessions take center stage. Toys quickly come to mind as our kids outgrow them and lose interest, but it’s important that as parents we participate in letting go of some of our “toys” too. With the holidays typically brining an influx of new to our households, this is a chance to sift through the old and gently used. Having your child choose items to donate to those in need and talking about the actual people that will be on the receiving end is a great lesson for helping kids to be thankful for what they do have. It can be a big lesson for kids to realize that not everyone has the same abundance of things as they do. This is a great time to reflect on the thankful turkeys and donated items in order to springboard conversations about those in need. As we talk about the needs of others, an opening to discuss being thankful for the things we often take for granted is made. Families can get involved by shopping for, baking, or crafting items to give to those less fortunate. A family trip to deliver them to a shelter or food pantry can drive home the needs of others. By getting involved, kids are provided with an understanding that we help others in need because we are thankful for all we have and our ability to do so. As the holidays approach and reminders about being thankful abound, it is a great time to get kids actively engaged in the idea of thankfulness. Amidst the holiday gift guides, twinkling lights, and other festive indulgences, these 4 family activities will build a strong foundation for an understanding and appreciation of what it means to be thankful.